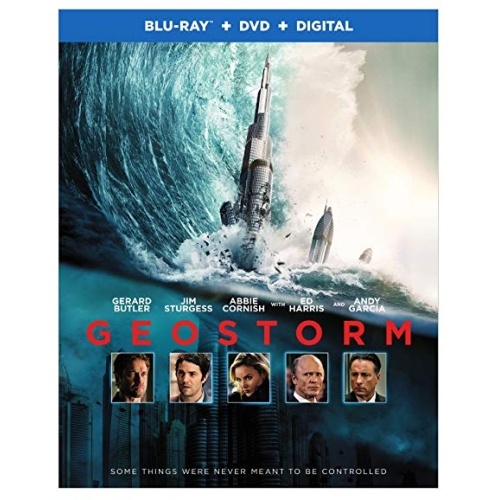 Geostorm is the latest thriller unleashed by Warner Home Video with a January 23rd, 2018 Blu-ray release. Dean Devlin co-wrote, produced, and directed this near future science fiction disaster thriller. The story follows a satellite designer who tries to save the world from storms of epic proportions caused by malfunctioning climate-controlling satellites. The film somewhat flopped in the USA but had a stronger following overseas. Following many natural disasters caused by climate change, an international coalition commissions a system of satellites to limit extreme weather. Named “Dutch Boy”, the system successfully neutralizes a typhoon when it is activated by chief architect Jake Lawson. However the Senate sub-committee fires Lawson for acting without authorization, and replaces him with his younger brother Max. Three years later a United Nations field team in Afghanistan discovers a frozen village in the middle of the hot desert. Makmoud, an Indian engineer working on the International Climate Space Station (ICSS), steals data from the Afghanistan satellite, but is soon after ejected into space. U.S. President Andrew Palma authorizes an investigation, and Max convinces Jake to go to the ICSS and investigate. When another satellite causes high temperatures in Hong Kong resulting in a firenado, Jake and his team find themselves fighting too many coincidences in their efforts to find the problem. Could it be that a high ranking government official is behind the sudden issues with the system? Regardless of the cause, Jake and his team race against the clock to prevent a massive ‘Geostorm’ that could wipe out life on the entire planet. Geostorm is another disaster film along the lines of The Day After Tomorrow and 2012, except that this new film features ‘unnatural’ disasters. Perhaps this is not too surprising, since writer Dean Devlin is best known for producing films for the director of these two movies. In any case, this new film is motivated by the issue of climate change, and proposes an answer to the problem, and then imagines that solution going rogue and wrecking the planet. As with the others of the genre, Geostorm suffers from ludicrous physics and scenes where disasters appear to chase characters around. With each catastrophe where countless people die, we are given one or two characters to identify with, who miraculously survive, in some cases by outrunning the disaster. There is some attempt at relatable themes, like the issues between brothers and the bond between father and daughter, but it is far from enough to save the movie. There was the theme of global cooperation, with stars from many different countries, which may well have been why the film did so well overseas. Up front and center are the special effects and Dutch Boy caused disasters that wipe out familiar landmarks all over the globe. I guess we can be happy that at least the White House wasn’t destroyed again in this movie. The long and short of it is, if you like big action disaster films, Geostorm may well deliver, but you can’t afford to attempt to take it seriously. The cast includes Gerard Butler, Jim Sturgess, Abbie Cornish, Alexandra Maria Lara, Daniel Wu, Zazie Beetz, Robert Sheehan and Amr Waked. Geostorm was directed by Dean Devlin, who is best known for producing films for Roland Emmerich. Reviews for the movie were mostly pretty bad, with a Rotten Tomatoes score of 13%. The public response was quite a bit better, with an IMDb score of 5.4/10. Geostorm saw limited success in the domestic cinema, taking in just $33.7M at the US box office. However it grossed $212 million worldwide, which was almost double its $120M budget. The video on the disc is an AVC 1080p encode at 30 Mbps, and is presented in its original aspect ratio of 2.40:1. The movie has a strange, high contrast look to it, which may have been an attempt to better blend with the special effects. However this gave some of the characters very dark eyes that appeared in most scenes to have no colour at all. Nonetheless the images presented this artistic choice cleanly throughout, with solid image quality from this high bitrate transfer. You will find full resolution PNG screen captures taken directly from the disc at the details page for Geostorm. The disc is a dual layer BD50, with 34.6 GB used and is coded for All Regions. 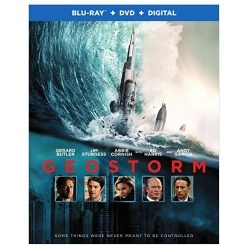 This Blu-ray release for Geostorm has a small collection of supplemental featurettes. This section takes a look at the visual effects that went to create the world of Geostorm. They obviously had a lot of fun with the tasks at hand, with both the outrageous weather and the creation of the future international space station. Director Dean Devlin discusses the creative journey that led to Geostorm, inspired by his daughter’s question about global warming. The internationally diverse cast talks about their experiences on Geostorm, with the crew on the international space station. Geostorm is a popcorn movie that will appeal to disaster movie fans but has little of interest for the serious cinephile. Warner Home Video has put together a technically strong presentation for the film, along with around 15 minutes of supplemental features. Wreaking Havoc: Cutting edge visual effects, research and technology create the world of Geostorm. After an unprecedented series of natural disasters threatened the planet, the worlds leaders came together to create an intricate network of satellites to control the global climate and keep everyone safe. But now, something has gone wrong – the system built to protect the Earth is attacking it, and its a race against the clock to uncover the real threat before a worldwide geostorm wipes out everything… and everyone along with it. This entry was posted on Wednesday, January 31st, 2018 at 8:33 pm	and is filed under Action, Blu-ray, Commentary, Sci-Fi, Science Fiction, Thriller, Warner. You can follow any responses to this entry through the RSS 2.0 feed. You can skip to the end and leave a response. Pinging is currently not allowed.